Brief Synopsis –Biographical documentary about the turbulent life of comedian Chris Farley who due to excess in drugs and alcohol died at the young age of 33 in 1998. My Take on it – Anyone who grew up on SNL and watched it in the 90’s, knew who Cris Farley was. He was an extremely overweight comedian that had such a strong presence when on the stage or screen. Unfortunately, he suffered from many issues off screen that ultimately led to his accidental death at the very young age of 33. This documentary tries to give us answers as to why this all happened and does so in a very comprehensive and intimate way. The problem is that it doesn’t dig deeper than the surface of the matter. It’s easy to see in hindsight all of the issues that led to his death and every one of these celebrity interviewees points out road signs that no one took seriously enough. Obviously this isn’t a documentary trying to lay blame on anyone for now opening their eyes, but it could have been done in a much more in depth way in order to try and understand better the effect that his death had on the SNL and comedian world as a whole. We learn so much about his excessive lifestyle via a long list of celebrity interviews, home videos and of course via real footage of Farley both on stage and off. We get to see in hindsight what unfortunately wasn’t seen back then as to the path to destruction that he followed and how his outward and inward personalities were so dramatically different from one another. His death wasn’t the first to go down such a path and unfortunately wasn’t the last either since it has happened over and over in the celebrity culture and industry. Bottom Line – Very comprehensive documentary that stops digging too soon. Excellent list of interviewees who were close to Farley makes this very interesting and eye-opening to watch. Unfortunately, the arc of his life followed many other stars and was cut too short by not being able to handle the pressure of fame and the availability of excess drugs and alcohol. Recommended! Aww. 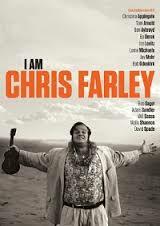 I loved Chris Farley! I hate risking features like this ’cause sometimes you can never see them again without invoking all the pain and sadness you learn about.